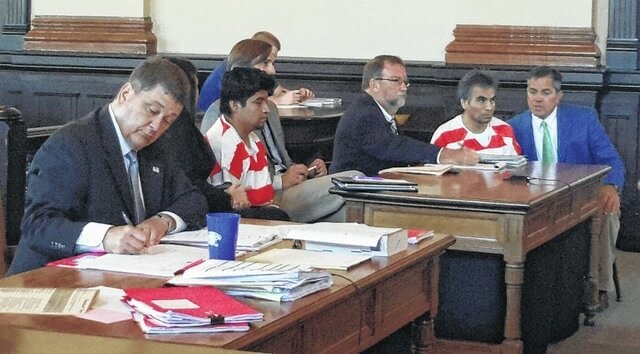 John Scott, assistant Fayette County prosecutor (left), with counsel and interpreters for Cruz (center) and Hernenegildo (right), both of whom were arraigned Monday in the Fayette County Court of Common Pleas on charges of murder and aggravated murder. A father and son appeared for arraignment Monday in the Fayette County Court of Common Pleas on charges of murder and aggravated murder. German Cruz, 49, and German Hernenegildo, 22, each were indicted last month by a Fayette County grand jury. Cruz and Hernenegildo were charged following an investigation into the death of Venancio Arquimides, of Bloomingburg. Arquimides, 42, was found beaten to death in his apartment July 20 near Yatesville. During Monday’s arraignment, Susan Wollscheid was appointed to serve as co-counsel, along with Herman Carson, for Cruz. Carson said Cruz was not a lawful resident of the United States, but was unable to support that statement with any evidentiary documentation at that time. Kathryn Hapner and Thomas Arrington will serve as co-counsel to Hernenegildo. Judge Steven Beathard set bond for each man at $10 million. The cases were joined and set for trial Oct. 19 at 8 a.m.
https://www.recordherald.com/wp-content/uploads/sites/27/2016/09/web1_20160906_111042-1.jpgJohn Scott, assistant Fayette County prosecutor (left), with counsel and interpreters for Cruz (center) and Hernenegildo (right), both of whom were arraigned Monday in the Fayette County Court of Common Pleas on charges of murder and aggravated murder.